Structural Integration (SI) for horses is a series of treatments using highly proficient, touch skills to break down adhesions within the soft tissue of the body. Why? To help the horse release compensations and holding patterns to return proper alignment, balance and full range of motion to his structure as a whole. SI organizes the tissue to restore natural posture and alignment which will create functional ease of movement. By unwrapping these restrictions, the sticky adhesions release their hold and fluidity of muscles can once again effortlessly slide over one another. This process also allows blood flow to return to full capacity, bringing valuable nutrients and oxygen back into the affected area. This is the beginning of the recovery process. The result of a successful series of sessions can teach a horse to be more aware of how his structure is balanced, and how individual parts of his body are related to one another. Performance will increase through efficiency. Not only does physical balance improve, but emotional balance emerges as well. A horses true personality can be dampened by pain. After a SI session the horse may become playful and powerful. Holdings take energy from the horse and release returns this precious stored energy with a new awareness the horse needs to thrive. When locked tensions are released the horse can relax, he can enjoy learning again, instead of holding onto old fears he associated with pain. Other terms are, soft tissue or connective tissue. Believe it or not this adaptable tissue is an overlooked organ. Fascia is the organ of form, the organ of stability. This weblike, glossy material encases each and every muscle, tendon, ligament, organ , nerve, in the body. It is made of densely packed collagen fibers that creates of system of fascial sheets, chords, pulley’s, dividers and wrappings within the body. It provides stabilizing pockets for the muscles. It protects, connects, and keeps the horse’s body in a form-like shape. Without it, the horse would fall into a bone filled, puddle of goo. 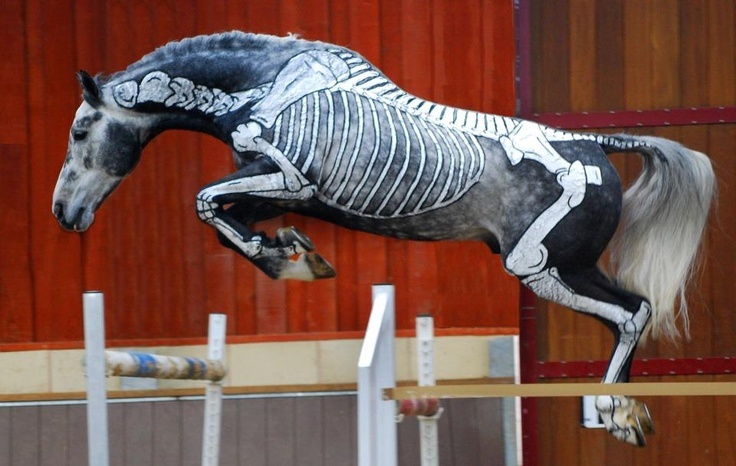 Fascia affects every movement the horse makes. If the tissue is pulling, tightening, protecting , say a shoulder, the tissue can pull the bone and joint out of place, causing stresses far into the fascial web which will induce compensations in many areas. To recap, what exactly does it do? It wraps around each individual internal part of the horse allowing the parts to slide easily over one another. When the tissue is compromised, sticky adhesions form, the tissue shortens, tightens and protects the damaged area. This chain reaction creates unnatural, held movement patterns which affect the horse’s entire way of going, fluidity is lost. Common tissue adhesions in horses easily form from old injury, strains, stress, surgery, inflammation, kicks, bites, and most commonly saddle fit and unbalanced riders. As mentioned above, connective tissue acts like a lubricated sheath allowing muscle groups to move freely back and forth over one another in full range of motion. When a horse becomes injured, dehydrated, malnourished or simply overworked, these lubricated sheaths dry out and adhere to one another. This is the beginning of the formation of scar tissue and is what is responsible for the restricted range of motion that leads to improper movement that eventually leads to system breakdown and injury. This is because once scar tissue has begun to form it continually impacts the surrounding healthy tissue. Scar tissue begins to form as a result of the connective tissue sheaths “drying out”. The drying out process is also a shrinking process. The effect is similar to tossing a wool sweater into a dryer. This shrinking process leads to restriction of blood flow that reduces oxygen and nutrient supply to the cells and that impacts the health of the surrounding tissue. As a result, the surrounding tissue begins to “dry out” as well. The rider will often express the horse does not easily pick up a lead, or goes better to the left than the right. The rider can feel that the horse lacks balance, flexibility, and/or impulsion and his powerful hind end has lost energy and momentum. The horses attitude can change due to discomfort, while balking and irritability occur. The following series of treatments is a working blue print of the horses structure on it’s path to healing, balance and strength. WHAT IS THE EQUINE NATURAL MOVEMENT 5 SERIES? Because of the complex nature of the connective tissue structure, the treatment program usually requires a series of sessions. Each session builds upon the last allowing the practitioner to access deeper and deeper layers of compression until finally the body’s core compression is released. At that point, the body is free to realign itself. One week between the first several sessions is average. Sessions 1-3 restore fuller mobility to each muscle, sessions 3-5 integrate that mobility by focusing on groups of muscles working together with efficiency. The horse will continue to open on its own several weeks after the work. Repetition builds positive effects over time and requires neurological patterns to activate healthier patterns. SESSION 1: Is about building trust and rapport with the horse. Slowly and respectfully discovering the horse’s superficial tension patterns which leads to identifying deeper holdings that are the roadmap for a continuing series. SESSION 2: Gives the horse a better sense of stability so he’s more secure in moving on and off the ground. This session also helps to bring out the power available in the horse’s hind end. The focus of this session is to free up the tendons and musculature in the legs, and the restrictions in the shoulders and hind quarters. SESSION 3: The objective is integrating muscle groups that share movement functions. Working on functional quadrants rather than individual muscles. The focus is working on the spine and the barrel to connect the front and hind ends which allows energy to move and flow freely without running into restricted tissue. SESSION 4 and 5: These are integrating sessions to bring out the fluidity of the body as a whole. 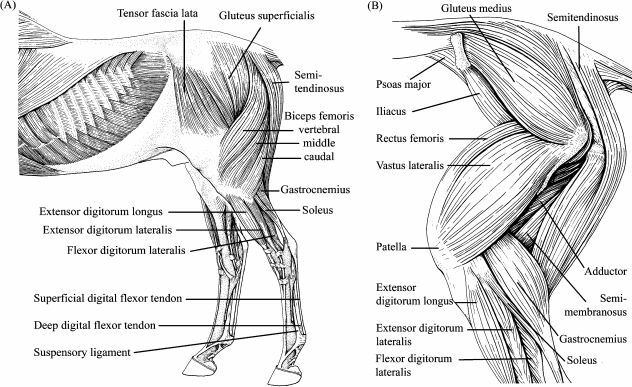 The sessions reinforce changes in the animals body while maintaining flexibility of the fascia while the horse strengthens into an integrated movement pattern. THE RESULTS: improve postural alignment, body awareness and functional balance, as well as resolving pain and discomfort from back pain, surgery, ageing, old injuries etc. Once the tissues are no longer holding and protecting the injured body part, the horse can start to use the muscles correctly which cuts a lot of time off most rehab programs. Structural Integration works hand in hand with many healing modalities. Chiropractic is more easily achieved when the tissue is softer, more responsive, the bones move with greater ease, adjustments last longer. SI work can stop the tissues from pulling the bones out of place in the first place. Chiropractic may very well be avoided when the body starts to adapt to it’s new freer structure. HOW LONG DO THE EFFECTS OF THIS WORK LAST? 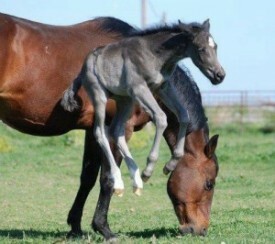 When horses experience freer movement they readily adopt it. Incorporating an exercise program to support the structural changes, the horse will maintain steady improvement that lasts. With the series complete, maintenance sessions are then scheduled based on the horse’s workload and tissue type. On average, these sessions are recommended every two to four months for performance horses.